When it comes to drag racing excellence, Team Arctic’s Glenn Hall of Gordon, Wis., is among the very best, having tied the rare combination of outstanding engineering/set-up with a mastery of the subtle (yet critical) decisions and reflexes of a great driver. The result has been a decade at the top of the sports most competitive Stock and modified classes, as well as a job as Race Director/R&D Specialist for D&D Powersports. But all of that nearly ended during a run at the Sno Baron’s Hay Days Grass Drags last summer, when Hall went into a fence at more than 130 mph. Nine months later and already back racing, Hall (50) was nice enough to answer a bunch of questions about that fateful day and his remarkable career. AI: Let’s start with the challenges you’ve faced since Hay Days last year, when you suffered a serious crash into a fence. Descrive what happened there, what your injuries were and what the last nine months have been like? Hall: As with most accidents, there wasn’t a single cause, rather multiple mistakes plus some bad luck that culminated in disaster. The first was lane choice. In hindsight, it was pretty stupid to make the first full pass of the year in what I knew was the most challenging lane. Lane 4 at Hay Days is slanted significantly to the right (for drainage, I have been told) which, combined with the crosswind from the left, made a drift to the right inevitable. Normally, I would place the sled on the right side of the lane, and point it to the left, to compensate. The right side of the starting line was a little tore up, and I couldn’t resist the virgin clay on the left side. Placing the sled on the left side of the starting line forced me to point the sled more straight, rather than angling to the left. Second… wind. Though not as significant as other factors, it didn't help that the wind gusted significantly, just as I began the pass. Third… driving. Once the run started the sled began to drift right at about 350 ft. My standard focus is on the finish line timers, and if a run starts going crooked, I know to lift if the trajectory is not going to make it through. My finale mistake was taking a split second to realize that, even though I was on course to clear the timers just fine, the angle pointed me towards the even steeper sloping right edge of the lane in shutdown. When I shut down at about 450ft, 3.66 seconds into the run, my track speed was 137 mph. I was on the brakes, through the timers at 3.99 seconds/133 mph. The sled went over the raised edge of the lane shortly past the timers and there was no turning it back uphill. As I approached the fence, I leaned away as much as I could. Upon contact with the fence, the sled catapulted out from underneath me, high into the air, as I stayed near the ground plowing along/through the chain link fence until finally coming to a stop. From that moment on, my luck started going the other way, as bystanders were immediately on the scene, clearing the fence from me. The EMTs were right behind, and the doctor says they deserve credit for the good prognosis on my leg, as their care of my dislocated knee prevented the nerve damage usually associated with that type of injury. In addition to the knee injury, there was a broken scapula, five cracked vertebrae, five cracked ribs, significant internal organ "bruising" and a mangled right pinky finger. I had four surgeries during my 32 day hospital stay and I was very uncomfortable most of the time. The nearly daily visits from family, friends, and fellow racers helped make that time bearable. Today I am back to work full-time. I have been mostly pain free, since leaving the hospital, though my recovery to full function has been slow. AI: And you’re already racing again! Was there ever any question in your mind about whether you’d do it again? AI: Okay that all sounds pretty ugly, but I’m glad you’re doing so well now. Let’s jump back in time a bit. When did you start racing and what are some of the highlights that you’re most proud of? 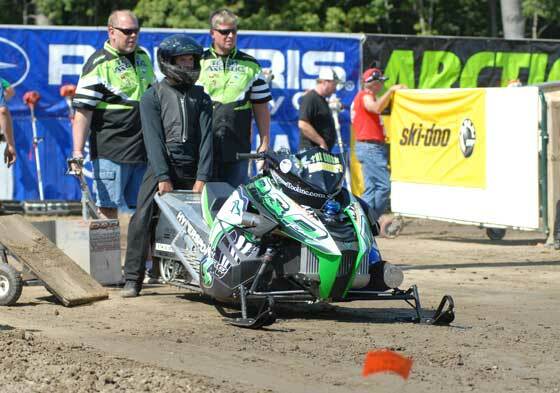 Hall: I entered my first grass drag in 1992 with my ‘91 Arctic Cat Wildcat 700. I got beat pretty bad but I was hooked and gradually started learning what it takes to be fast. By 2000 I was starting to become competitive. 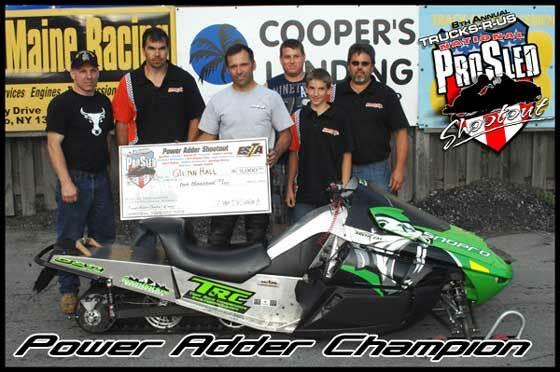 I had finally gained the attention of Arctic Cat drag race coordinator, Al Shimpa, and started getting more help from D&D Powersport's Dale and Dan Roes. My first big win came at the 2002 ISR World Series of ice where we won five classes with three sleds. I scored my first Hay Days win in 2003. AI: Is grass drag racing and/or asphalt drags different now than it was 10 years ago? It seems to me that the one big change over the past decade is the incredible power that’s available now thanks to the turbo-charged 4-stroke engines. 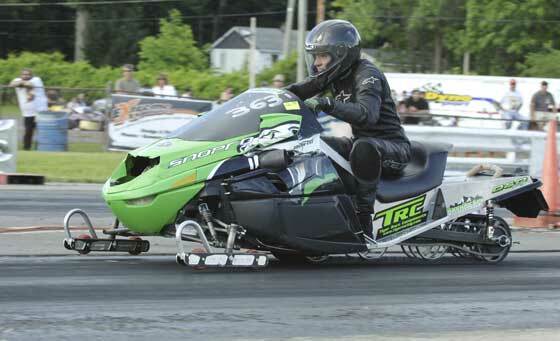 Hall: Snowmobile drag race entries have been on the decline since I became serious in the late 1990s. Back then, there were maybe 4 – 5 fast guys and 30 or 40 "less competitive" entries in a class, so a well prepared racer could expect to have a few easy rounds on the way to the final. Now, there may only be 10 to 20 sleds in a class, but they are ALL fast, and the first round is just as tough as the final. As far as the big power is concerned, that is really only a couple of classes and that is a whole different kind of racing. With the turbo sleds, power is not the limiting factor and the challenge is learning to apply just as much power as the racing surface and whether the sled can handle in the changing conditions. AI: In your opinion, is there too much power on tap now for grass drag competition? AI: What do you expect the 500-ft. elapsed time/mph will be for the quickest/fastest mod sleds in the next 5-10 years? Hall: I think Outlaw sleds have potential for 3.60's in 500 ft if we can get on a well prepped, smooth track in cool weather. AI: Is there one particular area of mod sleds that’s holding back the next leap, or is it a combination of all the usual ingredients like power, clutching and suspension/traction? Hall: I would say it’s the combination you mention, with the exception of the power part. 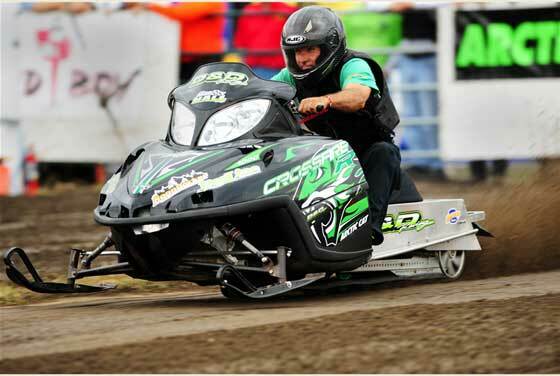 Any of the turbo Outlaw sleds are capable of much more power than we know how to harness. For example, the Green Hornet has been dyno’ed at over 600 hp and can make even more than that, but we never raced at more than 550 hp. AI: What races will you compete in this year and in what classes? Hall: That's still a little up in the air. I am still not strong enough to handle an Outlaw sled, but I am hoping to be ready by Hay Days. I am excited about the new Improved Stock Turbo class and will be running my own Arctic Cat XF1100 Turbo in that class for sure. I am also involved in a couple of Arctic Cat Wildcat UTV sand drag projects. I hope to have our Z1 powered unit ready for competition before the end of the year. AI: Tell us about your highest performance race sleds… weight, engine, horsepower and such. Hall: I still really like the 2-stroke turbo's. The 2008 Proline Chassis speed run sled that briefly held the 1000-ft speed record at 170mph, and the 2009 Firecat chassis grass drag sled that briefly held the 500-ft record at 3.79 seconds/142.4 mph are a couple of my favorites. These sleds were in the mid 500's for horsepower and much lighter than the current 4 stroke sleds. 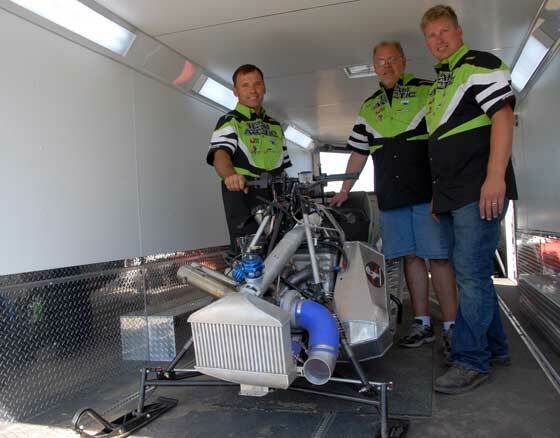 The Green Hornet 4-stroke sled (above) has surpassed the old 2-stroke in testing, but sadly has not had the track conditions to post a record time in competition. Its reconstruction from the wreck is almost complete, and I fully expect it to post record times soon. AI: Describe what it’s like to launch a current mod sled on both grass and asphalt. Hall: At over 3 G's of acceleration force, it’s a real thrill. AI: What’s your role in the engineering and construction of your sleds? Hall: Some sleds I built almost entirely on my own, but recently many are built by customers or sponsors with input from me. The Green Hornet was built (and is being rebuilt) by Craig Campton Hypersports. 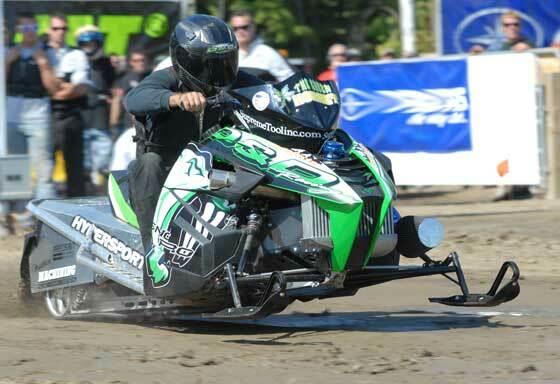 Hypersports has been instrumental in D&D's 4-stroke race program. AI: To have success at your level of competition, put a percentage on how much of it is the following three elements: the sled; the set-up on race day; and the driver? Hall: For most drag classes, pre-race performance prep is the most important. For the Outlaw sleds, race day set-up is more critical. The driver is somewhat important in the stock classes, but less so on the faster sleds. You just need to hang on and not screw up! AI: When did your connection with Arctic Cat begin, and what is it that you like about brand? Hall: I met Al Shimpa in 2000, and got accepted to the race program for 2001 model year. I have always admired Cat's commitment to building the fastest sleds. AI: What is your all-time favorite sled, and why? Hall: It would have to be a tossup between the 1993 Thundercat, 2003 Firecat, and 2012 Turbo. These sleds were/are so dominant for their time. AI: How long will you continue to race? And once that time comes, what’s your plan? Hall: Years ago, I remember telling people I would race until I was 50. Well, now I'm 50 and I don’t feel like quitting any time soon. No real plans for that. AI: That’s good news. Tell me about your sponsors who help make it happen? Hall: Arctic Cat and D&D Racing have been the most important to me, by far. I Have been directly employed by D&D since 2005. Additional sponsors include Proline Performance for chassis parts; Boondocker will the fuel controllers and turbo components; Supreme Tool for the clutches and drivetrain components to handle the big power; Stud Boy, which has been with me from the beginning, for traction; and more recently, Precision Turbo and Vi-pec have been important for the outlaw stuff. AI: Last request… tell me a Roger Skime story. Hall: It was my most recent trip to the factory, and I was still in the wheelchair. I got a friend to drive me up there with the promise of a factory tour. Somehow, Roger found out we were on the tour and came down and found us on the factory floor, just to say hi and see how I was doing. although i never raced it like Glen, i've been hooked on Cat ever since! cheering him and his cat's on! The outlaw sled is wicked, can't imagine 3g of force. Cats have almost always been on top at haydays. thanks to Glenn and the other racers for making it that way. Gorgeous pictures! But what kind of toturre did you sign up for?? We always go to our trusty Home Depot to get our tree! I would love to go up into the mountains and cut down our own but I'm just not that brave! You? You are my hero! I hope you had yourself a nice Hot Tottie when you got home!